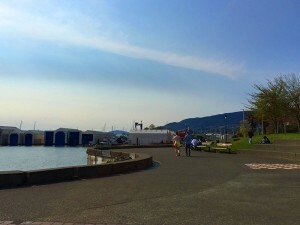 Waterfront park is just a few minutes walk from the Lonsdale Quay and Seabus/Bus Terminal. Head to the west past Chesterfield Ave. through the brick road and you’ll be there before you know it. 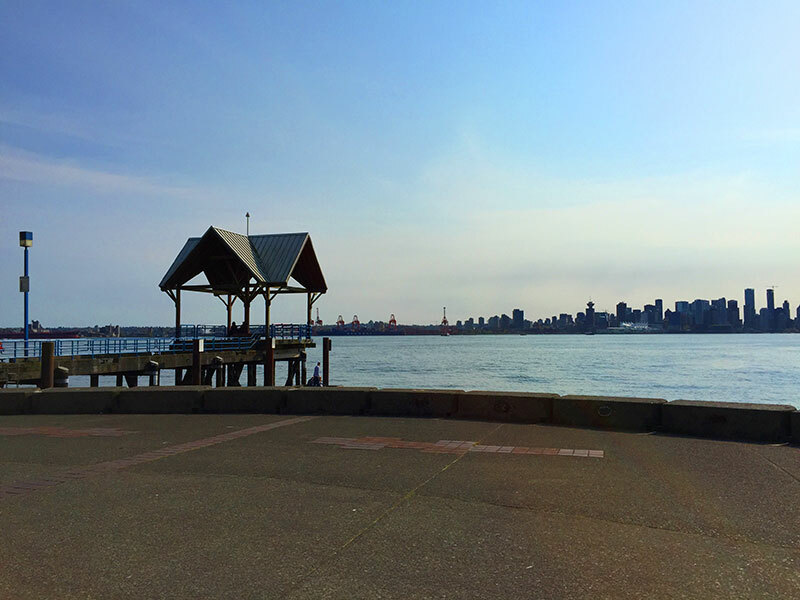 Waterfront Park has a beautiful but short walk along the waterfront and there is a pier with benches that is perfect to relax for a few minutes to take in the view of downtown Vancouver. 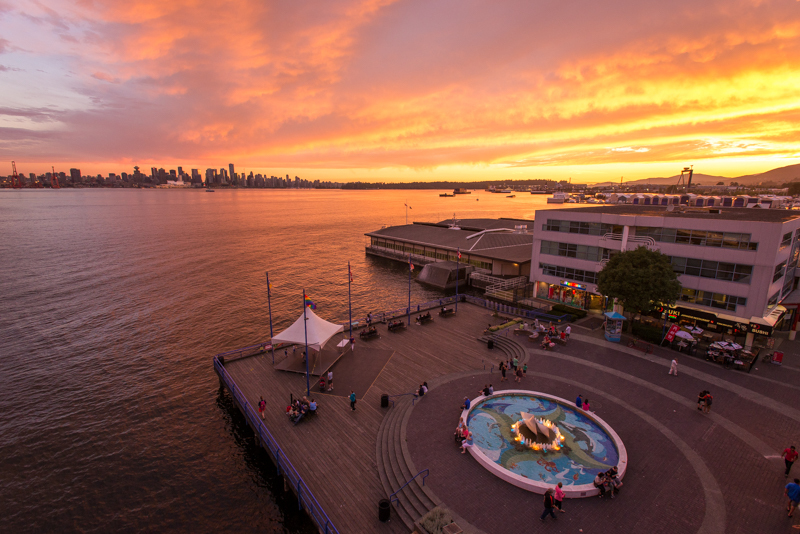 Before heading over, grab a snack from the Lonsdale Quay and have a picnic while watching the sunset. Baked goods travel well. People watch from behind a pair of sunglasses as you relax with a coffee. Take a break and read a book on the concrete steps. Bring the kids to play in the playground. Take a photo with the Korean Friendship statue or The Cathedral structure on the field. It resembles the North Vancouver mountains and was installed in 1986 by artist Douglas Senft. During the Summer, partake in the different festivals at Waterfront Park… Caribbean Days Festival, Philippine Days Festival and more! 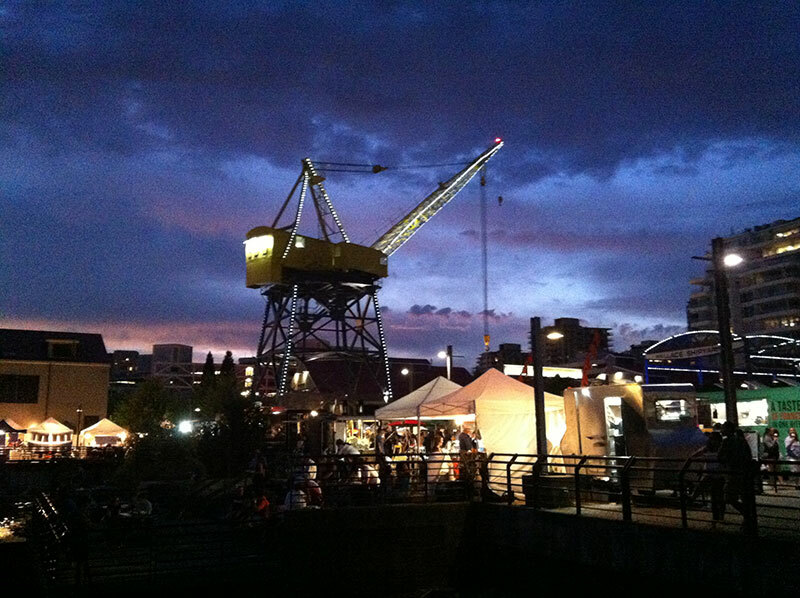 There’s so much to do and so much to see at the Shipyards Friday Night Market. Located at the foot of Lonsdale, the outdoor market provides fun and entertainment for everyone. Wander through the stalls to find artisan handicrafts like photos, paintings and jewelry. Grab a beer at the Beer and Wine Garden while listening to great bands play on the stage. Shop for farm fresh veggies, organic meat or wonderful baked goods. Eat your way through “Hot Food Alley” (over fifteen food trucks) or grab some snacks from the other food stalls. Given the huge variety of trucks, it’s hard to settle on just one. If you can only go to one truck, make sure you check out Chou Chou Crepes www.chouchoucrepes.com for a Chou Chou Crepe filled with her own homemade caramel. She’s worth seeking out so I follow her on twitter to make sure she’ll be there. They Shipyards Market opens May 1st this year and goes until September 25th. Visit www.northshoregreenmarket.com for more information. A sunset in Vancouver should not be missed and if you’re looking for a great place to see it, give the lookout tower at Lonsdale Quay a try. Afraid of heights? This may not be perfect for everyone but there are a few different levels in which you can view it from and you can always take a seat near the railing at sea level for a different viewpoint. Depending on what time of year you’re in North Vancouver, the sun should set just over Coal Harbour across the Burrard Inlet. The stairs to the lookout are located at the south east corner of the second floor outdoor area. Just follow the first flight of stairs at ground level outside the market, cross the deck on the second floor and there they are. 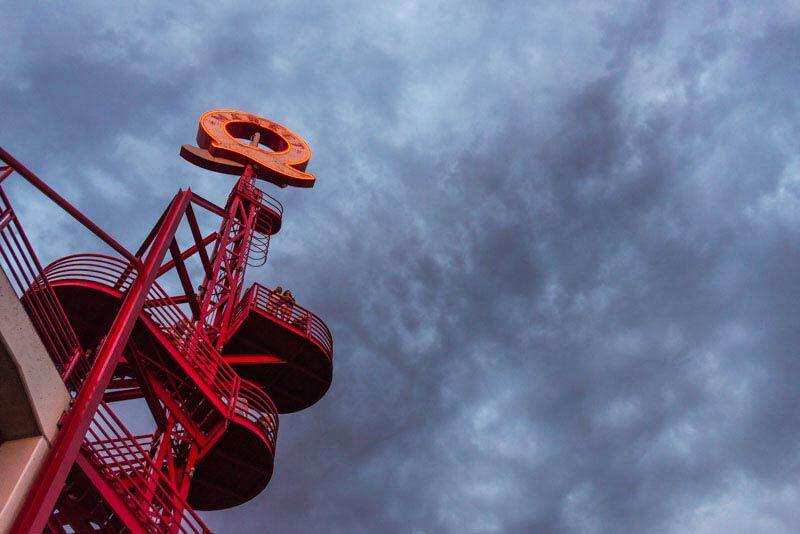 A few more flights of stairs and you’re at the top just below the giant “Q”. The viewing area is small so try to let others have a chance to spend some time if there are a lot of people there. It’s generally fairly quiet though. Take a look to the North to see the North Vancouver mountains and a little more east to see the Pinnacle hotel and Shipyards square. The Shipyards square is packed with people on Friday’s and Saturdays during the summer months for the weekly night market. That’s worth seeing if you’re in the area on those nights. If you turn south you’ll see the high rises and office buildings in downtown Vancouver as well as Canada Place just across the water. The view at dusk is really spectacular if you can wait that long. To the west is Stanley Park and the Lions Gate Bridge. You should just be able to see it over the Seabus terminal below. As you can see, it’s well worth the climb for this spectacular view. From downtown Vancouver take the Seabus across the Burrard Inlet to get to the Lonsdale Quay. The market entrance is very close by. If you’re already in North Vancouver you’ll find the Lonsdale Quay at the foot of Lonsdale Avenue. The Crab Shop in North Vancouver serves what is quite possibly the best Fish and Chips in the city. 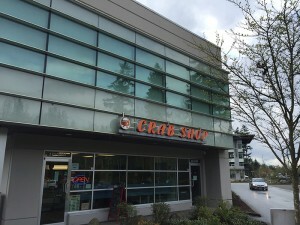 Not only that but they offer the freshest crab and seafood too! If you haven’t been there already you should definitely make a trip out to this little gem just off of Dollarton Highway on the way to Deep Cove. The staff is very friendly and while the food can take a while to prepare it’s worth the wait! This is mainly due to the volume of orders that come in, they’re very busy. There is limited seating inside the shop but that’s ok as most visitors who come through are ordering takeout and are on there way as soon as it’s ready. 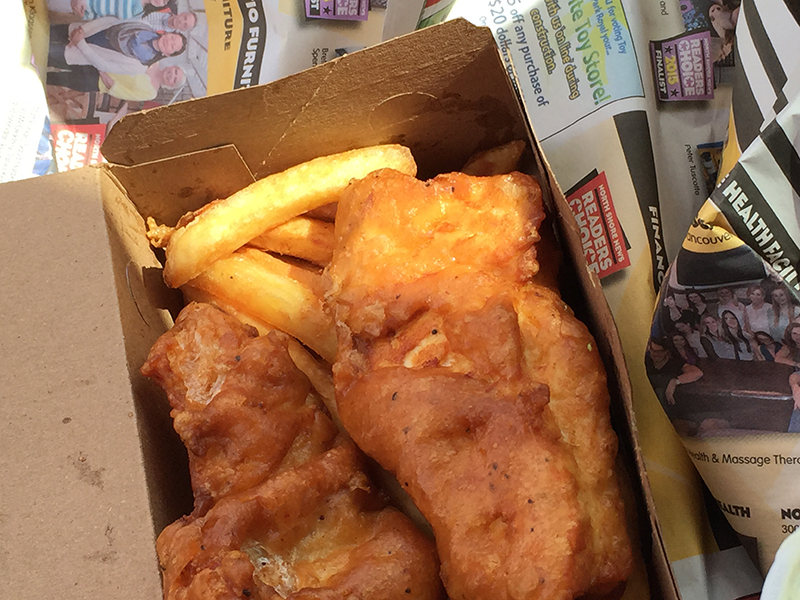 If you want to explore the area a little more, ordering takeout fish and chips is a great idea. They will wrap up your order nicely to keep it warm until you reach your final destination. I recommend driving a little further down Dollarton Highway and stopping at Cate’s Park for a picnic. Looking for a unique and spectacular view of the North Shore mountains? 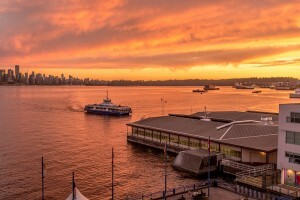 Why not see it from the middle of the Burrard Inlet on the Seabus! For just a few dollars you can take the Seabus across the Burrard Inlet from the Lonsdale Quay to Waterfront Station in downtown Vancouver. There’s windows on all sides that are perfect for sightseeing as you make the short 15 minute trip across. Depending on which way you’re going, make your way to the North side of the vessel to catch a glimpse of the Lower Lonsdale area and North Vancouver mountains. On the east side you’ll see the dry docks, the Ironworkers Memorial bridge and as you get closer to downtown Vancouver you’ll see the Port of Metro Vancouver. On the west side you will see Canada Place, Coal Harbour, Stanley Park and the Lions Gate Bridge. If you’re riding at night the best view in the house is on the South side as you are leaving or arriving at Waterfront Park. The beautiful lights of the downtown Vancouver buildings and Canada Place are really something! Unless you’re lucky enough to ride the Seabus daily, it’s worth the ride to see some great views of Vancouver.